In 2014 the Town Team explored what made Crediton unique; we have award-winning bakers, butchers, cheese and cider makers, brewers and industrial companies, but, alas, so do many other towns. When someone suggested St Boniface we were not sure how, if at all, we might be able to tell his story in a modern way. A towering religious figure from seventh century Crediton, and still renowned in Germany and Holland, he travelled widely in Europe, converted pagans to Christianity, famously chopped down their sacred oak tree, set up many churches, walked or rode to Rome three times, was blessed by the Pope, then years later was killed by pagans who stabbed him through his bible. A distinctive story certainly, but how to make that interesting today? It was the High Street Flags Project which pointed a way forward. What was starting to emerge with all the many different flag designs was an artistic form and theme of ‘figures and shapes of light through colour’, so when someone mentioned that Boniface’s story-sequence existed in eight stained glass windows in the parish church we sensed a way forward. 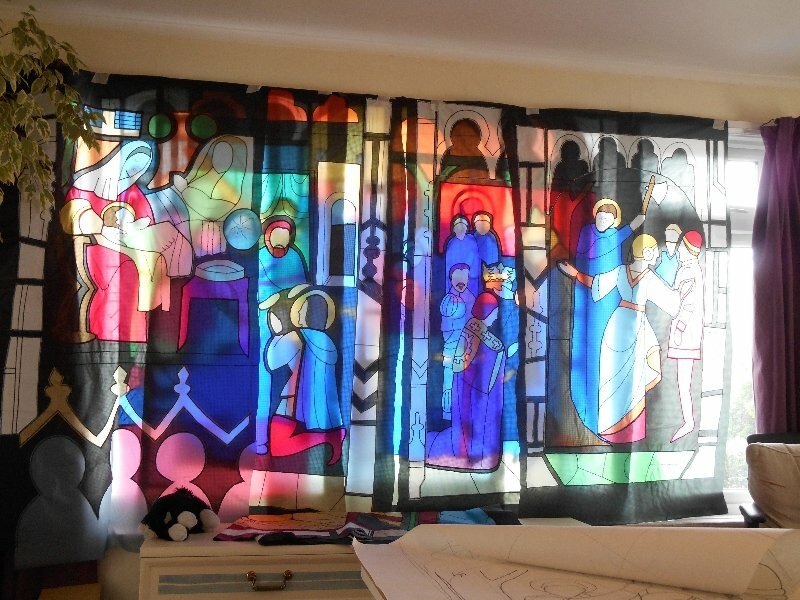 We asked our flags artist Charlotte Turner if she could roughly replicate and stylise those windows in the same rip-stop nylon fabric she used for the flags. The results were really exciting. We asked a local blacksmith to make metal frames to hang the banners from and that echoed the arches of the real stained-glass windows. 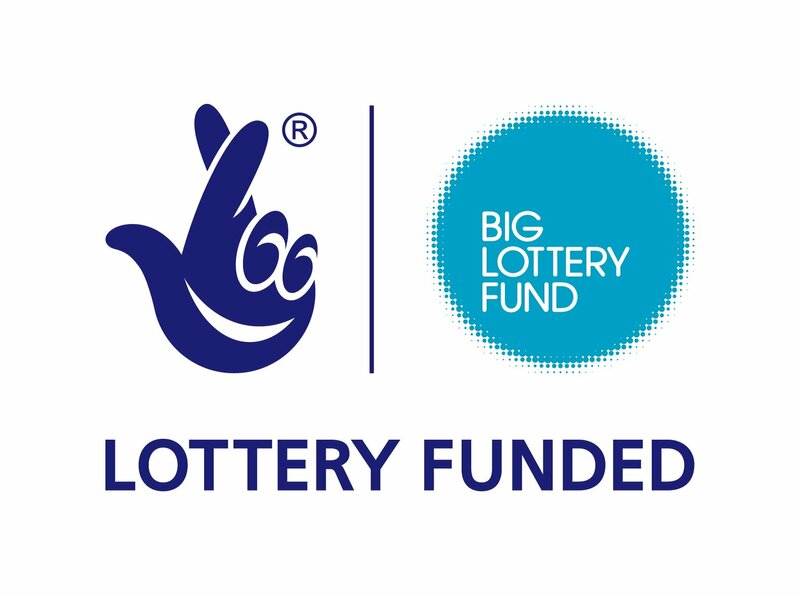 On Wednesday 20 February 20 the Crediton Town Team was awarded a grant of £16,000 from the LEADER fund – a European fund for rural projects – towards its Boniface Heritage Trail project. Earlier outline approval had been agreed by them in January 2018, which triggered a year of detailed town team project development, many community meetings, discussions on different possible locations and a long process of finding companies for each of the different stages of design-transfer, glass fabrication, steel fabrication and groundworks installation. Three companies for each stage were asked to provide competitive estimates. In a separate process last December after the town team had submitted all the technical details, Mid-Devon District Council granted planning permission for installing the Boniface signposts in eight different locations around the town. The planning approval came with a number of conditions including archaeological safeguards as well as health and safety requirements. Now that the funding and legal permissions are in place the Town Team will work on finalising the graphic designs ready for their transfer to full-size acetate sheets. The acetates will then be sent to a toughened-glass fabricator near Bristol who will bond each acetate sheet between layers of toughened glass, add extra membranes of ultra-violet filters to protect the design colours from sunlight, then ‘bake’ them in a special oven to bond all the layers together into a single thickness of toughened, laminated glass. After that, the eight panels will be transported to local steel fabricator Conibear Brothers in Crediton, the winning fabricator for that stage of the project. 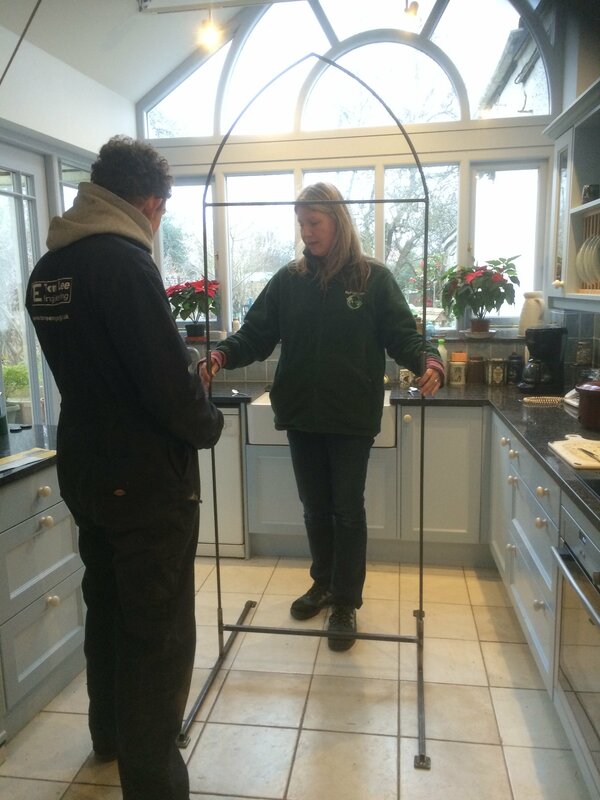 They will laser-cut and fit a vertical supporting steel frame around each one before attaching them to horizontal H-frames. Finally, local builders Steve Rowe and company, the winning groundworks contractor, will excavate the eight locations and lower the H-frames into place, bolting them onto concrete anchors and then re-surfacing the ground. All of this will take months to complete. With luck the eight toughened-glass panels will arrive in Crediton by the late summer, the steelworks will be completed by Christmas and the groundwork excavations and installations finished by Spring 2020. 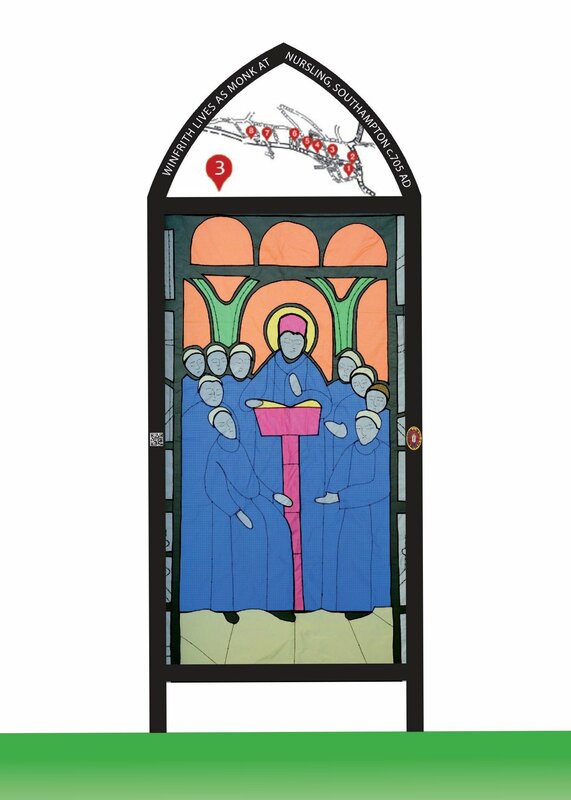 If all goes well, the eight Boniface heritage trail panels will be ready for visitors by St Boniface Day on 5 June 2020. Many people have been involved in the project to date, all of them voluntarily. 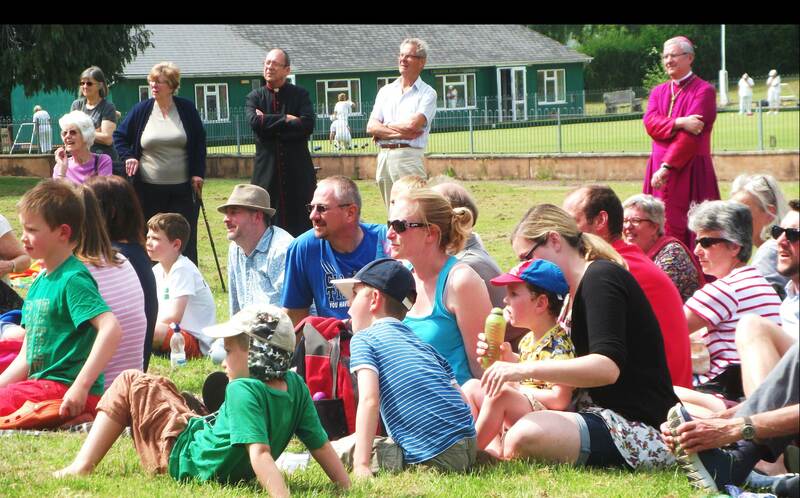 These include the town team’s project steering group, the graphic designers, Alison Shakspeare and Karl Triebel (of Hedgerow Print), structural engineer Bill Badger, photographer Richard Burston, funding advisor Paul Tucker, numerous Crediton town councillors, as many as eighty church committee members plus priests from the Crediton Roman Catholic Church, Holy Cross parish church, the Methodist Church and the Congregational Church, as well as officers and elected members from Mid-Devon District Council on whose land four of the eight toughened glass panels will be installed. The artwork – by local artist Charlotte Turner – comprises gentle and stylised versions of eight stained glass windows in the parish church. 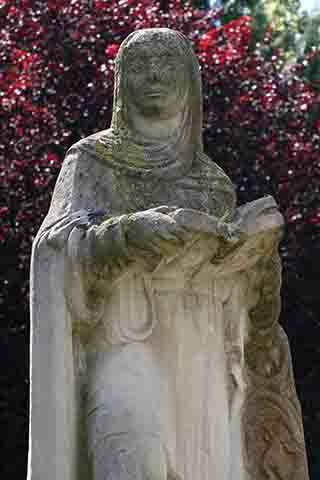 They tell the story of local monk Winfrith, later consecrated as Bishop Boniface by the Pope in 722 AD. Boniface is widely acknowledged as having founded the Christian Church in what is now Germany and Holland – numerous visitors from those countries come to Crediton each year to pay homage to his birthplace. 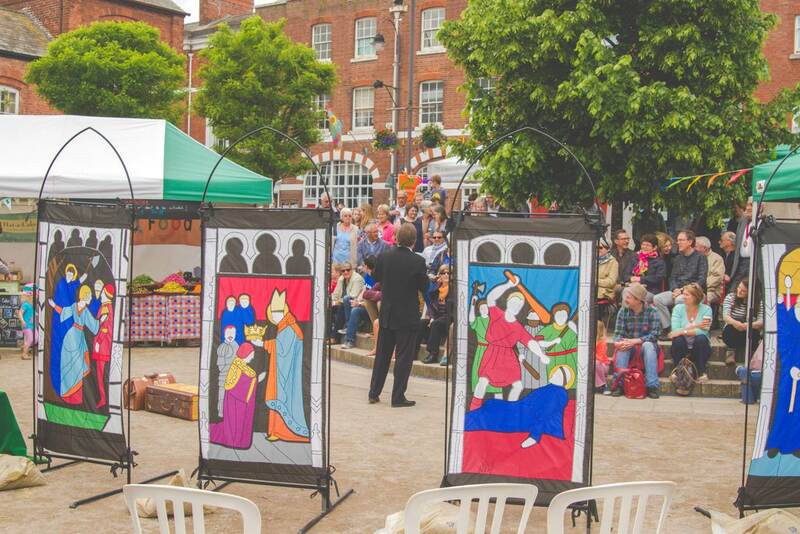 Among Charlotte’s other work for the town team can be seen the many high street flags which appear each year. The tough rip-stop nylon she uses for those gave her the approach she was looking for in creating the designs for the Boniface story – semi-transparent images which let the light shine through and can read from both sides – and it is those rip-stop nylon Boniface banners which have been carefully stretched and photographed ready for transfer to acetate sheets. “The funding award is a terrific result. We send a big thank you to the many people in the community, around 100 in all, who have voluntarily given their time to its development. The finished panels will have beautiful, gentle, distinctive designs and will take visitors perhaps 40 minutes or more to walk around. Hopefully they will attract more visitors into the town both from abroad and more locally to stop and look in along our high street while learning more about our famous ancestor. 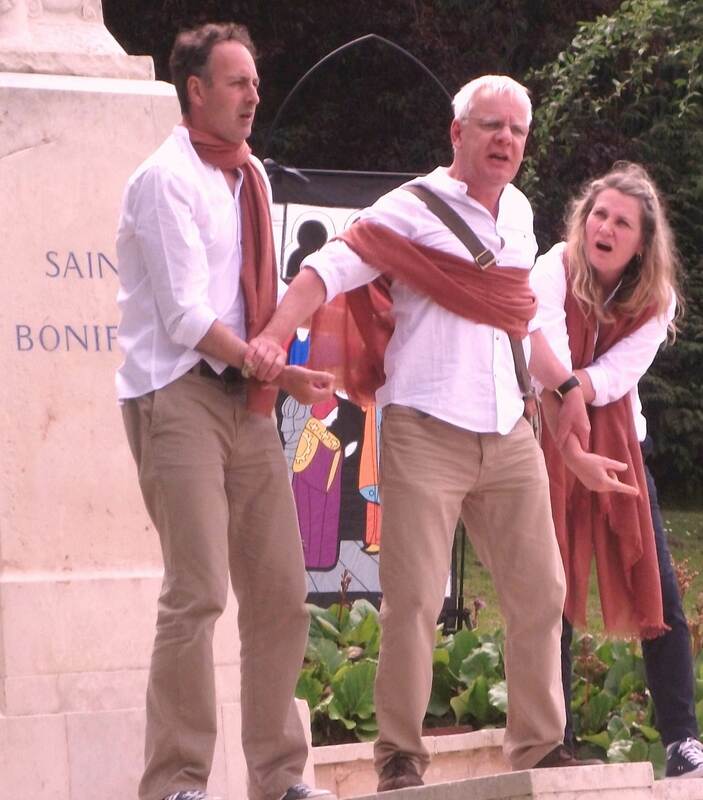 Rod was also the producer of the recent WWI English and German theatre production “Echoes of Wartime”, which played in both Crediton and Fulda. Do you have a comment about this Town Team project?